For the Canadian politician, see Robert Horner. James Robert "Bob" Horner (born August 6, 1957) is a former Major League Baseball third baseman/first baseman and right-handed batter who played for the Atlanta Braves (1978–86) and St. Louis Cardinals (1988). Horner was hampered by injuries for most of his major league career, and his career was cut short by collusion by team owners to drive down salaries by agreeing to not make offers to veteran stars like Horner. Horner was born in Junction City, Kansas, but grew up in Glendale, Arizona, attending Apollo High School in Glendale where he set school records. His college career at Arizona State University culminated with being named the first winner of the Golden Spikes Award. With his nine home runs in 1976 he is tied with Ike Davis (2006) for third all-time by a Sun Devil freshman, two behind Barry Bonds (in 1983). A second baseman for TSN's College All-America team in 1977 and 1978, Horner set a then-NCAA record of 58 career home runs for Arizona State, set a 25-homer single-season record, and was selected the MVP of 1977 College World Series. Horner was drafted by Atlanta with the first overall pick in the 1978 amateur draft, and he made his Major League Baseball debut the same year. He is one of a handful of players to go directly to the starting lineup in the majors without spending a day in the minor leagues. In his first game he belted a home run off future Hall of Fame pitcher Bert Blyleven of the Pirates. In 89 games Horner batted .266 with 23 home runs and 63 runs batted in in 323 at-bats, with an on-base percentage of .313 and a slugging percentage of .539. His 23 home runs led all National League third basemen in 1978. He won the National League Rookie of the Year honor over Ozzie Smith. In 1979 Horner batted .314 with 33 homers and 98 RBI; In 1980, Horner batted .268, 35 HR, 89 RBI despite being sidelined for 79 games in both seasons after recurring shoulder and leg injuries. In the strike-shortened 1981 season he hit .277, 15 HR, 42 RBI in 79 games. Horner enjoyed his best statistical season in 1982, finishing with 32 home runs, 97 RBI, and an OBP of .350 while slugging .501. In August 1983 Horner was hitting .303 with 20 homers and a career-high OBP of .383 when he fractured his right wrist while sliding, missing the last 43 games of that season. In May 1984, Horner broke the same wrist while diving after a ball and he was sidelined for the rest of the season. In 1985 Horner played 130 games and finished with a .267 BA, 27 HR and 89 RBI. In 1986, Horner set personal highlights. On July 6, 1986 in a game against the Expos, he became the eleventh player in Major League Baseball history to hit four home runs in a single game, and only the second one to do so in a game that his team lost (the first one being Ed Delahanty). Later in the season, after hitting a record 210 career home runs without a grand slam, Horner finally belted a homer with the bases loaded to give the Braves a 4–2 victory over the Pirates. Horner's record for homers without a grand slam stood until 1998 when Sammy Sosa surpassed the mark by hitting his first grand slam on the 248th home run of his career. 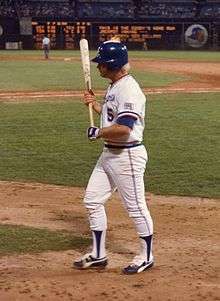 Horner became a free agent in 1987, after his first season of over 500 at bats. Although Horner was still near his peak, the Major League clubs were then colluding to drive down salaries, so no offers were made to Horner, who consequently signed a one-year contract with the Yakult Swallows of the Japanese League. He hit 31 homers and had 73 RBIs for the team. He was given number 50 by the organization because that was the number of home runs they expected him to hit. Horner returned to the majors in 1988 with the St. Louis Cardinals, but after 60 games he injured his left shoulder. After being invited to spring training by the Baltimore Orioles in 1989, Horner announced his retirement. In his ten-year Major League career Horner batted .277 with 218 home runs, 685 RBIs, 560 runs, 1047 hits, 169 doubles, 8 triples, 14 stolen bases, a .340 on-base percentage, and a .499 slugging average in 1020 games. On July 4, 2006, Horner was inducted into the College Baseball Hall of Fame as a member of its inaugural class.